The Reds and Pirates meet this afternoon in a 12:35 matinee at GABP to close out the series and homestand for the Reds.Ã‚Â Last night was a tough 12 inning loss for the Reds. 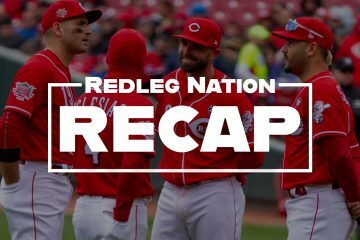 If you had to get to bed before the game ended you can check out theÃ‚Â RLN recap here.Ã‚Â Despite the loss last night, the Reds can still record a series win with a victory today.Ã‚Â Remember, these matinees are available on the usual Fox Sports OhioÃ‚Â outlets this year. Luis Castillo gets the ball to start the game for the Reds. Castillo appears to have left his early season struggles behind him and can now focus on continuing his development as a middle to top of the rotation starter.Ã‚Â In four prior May starts Castillo has pitched to a 2.78 ERA/3.39 xFIP. That’s solid work with little indication of an excess of favorable luck influencing his outcomes. The next way point for Castillo to take on is pitch efficiency and game longevity. He needs to first establish himself as a routine 6 inning minimum pitcher then learn to push to and beyond the 20 outs a game barrier on at least a somewhat regular basis. Ivan Nova will be the Pirates starter. The veteran righthander has struggled a bit in the opening fourth of the 2018 but has shown signs of returning to form of late. Comparison of his season’s ERA to xFIP suggests that some of his struggles may have related to a cycle of bad luck. This is also borne out by looking at his career versus 2018 peripherals. About 63% of Nova’s pitches are fastballs which he gets to the plate at around 92MPH. Most of his fastballs are four seamers (37% of all pitches); but he also throws a significant number of sinkers (26% of all pitches). His main secondary pitch is his curve which he throws about 27% of the the time at a typical speed of 80MPH. The remainder of his offerings are a slider or change up, both thrown around 88MPH. The Reds bullpen had to cover 7 innings Wednwesday night. Tanner Rainey and Dylan Floro each went 2 innings and would figure to be unavailable today.Ã‚Â I’d guess that out of caution due to the quick turnaround, Michael Lorenzen who worked an inning Wednesday will be held out of action today.Ã‚Â Jared Hughes worked an inning for the second consecutive night; given the turnaround, he is also likely not available. Five Pirates relievers were used to cover 6 innings of work. Leftie Steven Brault worked 2 innings and would figure to be unavailable. No one who worked Wednesday out of the Pirates pen had appeared on Tuesday and thus aside from Brault, everyone should be available for at least a short stint. Votto has the day off; no backstory to him being out of the lineup. If you like detailed explanations of obscure rules, this is just for you. Either way Brandon Dixon is still out and the Reds still lost the game perhaps in large part due to this play. And in other sports news….. Is the finagling finally over in Cincinnati’s bid to secure another major league sports team? Today is a quick turnaround not just for the teams but also for people who write about the teams. However, here is a thought to ruminate about. Since starting the season at 3-18, the Reds have played nearly .500 baseball (14-15). If they were to play .500 over their remaining games (56-56), they would finish the season with 73 victories which isn’t that far off what many of us saw as a likely result for the season before it started. This would also be their best record since 2014 when they won 76 games. Does this make you feel better or worse about the rebuild in general or the historically poor start to 2018?Ã‚Â And with that, here’s hoping the Reds play well enough to win today. Go Reds! Podcast — RNR #209: When will the Reds deliver on their promises?…plus: let’s talk about Scooter! Jim Walker has been a Reds fan as far back as he can remember. Some of his fondest childhood memories are Reds games at Crosley Field. In mid-2015, Jim retired after 30 years working with information technology, a career that started with a database on a single PC and finished with Him being a network hardware engineer. 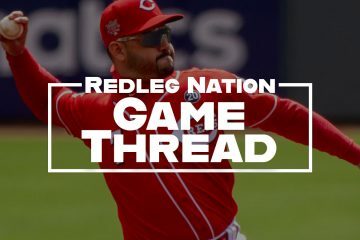 Jim lives in the Dayton area with his wife and three dogs, one of which is Charlie, his avatar on Redleg Nation and on twitter. I’m more interested this season in the young starting pitchers who will join Castillo and Mahle in the five man rotation for 2019. My feeling is that the “rebuild” has been going on long enough we should see some reflection of success in the record; and, the state of the starting pitching certainly plays large there. This didn’t really fit into the preview but…. In just short of a month with the Reds, Rosell Hererra got 1 start and a total of 13 plate appearances. By the end of today, if Brandon Dixon plays the entire game, in 3 days he will have half as many plate appearances as Herrera got in his time up. Sometimes I’m left wondering if there is any coordination between the people who make roster composition decisions and the people who make day to day decisions about who plays where and when. The Reds promised to deliver “winning baseball” to Cincinnati. We are not getting “winning baseball” by any stretch of the imagination. We are getting a hot, steaming pile fresh turds. Still plodding along with a .333 winning percentage. The rebuild is now an official mass failure. Talking European football on a Reds blog in May. Also looking at 73 wins like it is 93 wins is like picking the wrong door on Lets Make a Deal. Door #1 has a brand new Cadillac. Door #2 has Caribbean Vacation. Door #3 (The Reds door) is a broken down Yugo. No win. A fluke 4 game sweep in LA is skewing the record just a tad. This is really not a .500 team as it is presently assembled. Some changes need to occur like RStephenson being recalled and Mahle or Romano sent down. When DeSclafani is activated from the DL the other should be sent down since both have some work to do. Iglesias will be back soon. That will help smooth over the pitching. The offense is just way too inconsistent. Four good offensive players, 1 in the middle, and 4 that are bottom of the barrel. Upgrades are severely needed, but are not forthcoming, unfortunately. Four of the most offensively challenged hitters in all of baseball populate the Reds lineup on a daily basis. The Reds offense continues to sleep walk through most games. Going to have to throw down the flag on you Jim and penalize you 15 yards for unsportsmanlike conduct for bringing up European football. For the record, European football is about as exciting as watching paint dry. I would rather get the excruciating pain of watching a WNBA game or World Wide Rasslin than watch European football. I hope no taxes were raised or new taxes put on the books to build a stadium that will be vacated in 5 years or less. If European football starts outdrawing the Reds in Cincinnati, it will be time to move the Reds franchise. Here’s a part of “European Football” you might like, relegation. At the end of each season, the 3 teams at the bottom of each level in a country are demoted to the next lower level and three teams from the each lower level are promoted up a level. Think the Reds being put down to AAA and a top AAA team taking their place in MLB. You tank, you drop instead of being rewarded. That’s obviously never going to happen in US professional baseball. However, if the owners were serious about stopping tanking there are any number of ways they could apply the same principles. For instance, drop the 3 or 5 worse teams to end of the drafting order instead of letting them draft first and adjust their signing $$$ pool accordingly. Apply additional financial and draft sanctions to teams who are in the bottom pool for consecutive years. In the process you not only punish the bottom feeders. You help the teams finishing just above them by pushing them up in the draft order. So, suddenly virtually every game matters because most teams would want to win to get in the playoffs or alternately want to win to avoid “draft relegation”. I don’t need to defend “European Football” but let me tell you that I get tons more bang for my $ going to FCC matches than I have ever gotten from going to baseball games, and I happen to love both sports. FCC outdraws the Reds regularly for that very reason, it is entertaining, a decent quality product for minor league soccer and, while it may not be your cup of tea, my guess is you’ve not attended a live match or didn’t know what you were looking at if you did. At this point I don’t attend Reds games because the past few years too many were unwatchable and I ended up leaving long before the end of the game. Not a good way to spend my entertainment dollars. Is it like hockey? Good in person, but lousy on TV? It is hard to follow the little puck on TV. I find no excitement, none, from watching European football on TV. Guys running up and down the field and very, very little action and scoring to show for it. The announcers are really awful and all they seem to want to do is put their own little personal touch once or twice a game by yelling “gooooooaaaaaalllllllll”. Extremely annoying. Not saying European football players aren’t talented. I like a good bicycle kick, but you only see it maybe once a game. I’d rather take a 98 mph fastball to the cookies without a cup on than have to sit through a 3 hour long European football game. I’d rather take a nail gun to the face than have to sit through a European football game. At least one on TV. Now Australian football is a different story. There is some action to that. It is better live most definitely but I do watch it on TV as well. I watch more baseball on TV than soccer by far though. I need to have a rooting interest for soccer on TV but I’ll watch almost any baseball game. There is actually a ton of action (unlike baseball) in soccer. Scoring is hard which is part of what I actually like about it. Then again, as a child of the late 60’s, I like nothing more than a good pitchers duel in baseball. Or maybe that’s because I was a pitcher, lol. Soccer matches are typically done within about 2 hours, two 45 minute halves and a 15 minute halftime plus whatever stoppage time is added to each half, usually 2-5 minutes. Baseball games have become far too long for most people to endure. On a weeknight it was hard for me to stay to the end of a 3 Ã‚Â½ hour game when I had to get up for work at 5:00 a.m.
One of the things I like about soccer is that it is over within a predictable time frame. Great to get up on a Saturday or Sunday and watch a couple of Premier League games and have my sports fix, except for Ohio State Football out of the way by a little afternoon. Regular season hockey is also good in that sense. Game is over with a definitive winner in under 3 hours unless there are several really big fights or injury delays. College basketball lost me some time in the last decade when it seemed to become the norm to take 30 real minutes to play the last 5 clock minutes. I believe Reds are one or two starting pitchers away from taking a big step forward, around Harvey, Castillo, Mahle & Disco. One or two GOOD starting pitchers. The four you mention are still question marks. Jose Peraza got that base on balls after being down zero balls two strikes. I think heÃ¢â‚¬â„¢s walked in his last three plate appearances, wonder if thatÃ¢â‚¬â„¢s ever happened before. A quote from Marty…”this team does not have the guts to put Bailey in the pen”. Now that he lays off that low outside pitch, heÃ¢â‚¬â„¢s getting walks. I still like Winker’s bat…..maybe he needs to work on the new launch angle theories to get some extra basehits! It seems to be working for Cervelli and many others. I agree 100%. But he sure looks awkward on the bases and in the field. They should consider extending Suarez. The offense from the infield is fine….even if Peraza doesn’t end up panning out. The outfield is another story. Peraza is a strange one though? You write him off and he’ll put together 2-3 weeks. You think he turned the corner and he goes ice cold for 2-3 weeks and can’t hit a ball hard to save his life. I donÃ¢â‚¬â„¢t understand his lack of power, either. I wonder how he would do playing everyday in a ball park with a big outfield. Peraza needs to model his game after Dustin Pedroia. He doesn’t use his skillset very well. He has pretty good eye hand coordination and doesn’t swing-n-miss much at all, but he doesn’t use that skill to be pesky and get on base? A guy that fouls off 3-4 pitches and take pitches….can work a walk or get a cookie on 3-1 or 3-2 can really help the team and drive up the starters pitch count. Jose…on the other hand just hacks at anything and gets himself out usually. I can now say “I was there” for Dixon’s first major league base hit. In 18 years when he passes Pete Rose, maybe this ticket stub will be worth something! Dont look now but Luis Castillo is back in his top form. Averaging 14 pitches per inning. Good opportunity today to see if he can get thru 7 and push past the line-up a third time. WInker!! Now leave him in there everyday and see if he can get it going consistently!!! Why is this so hard for the Reds to figure out with the young guys? No patience at all with their young players.Its always been a mystery to me why they do the young pitchers that way and now it has spilled over to the position players.Winker has always hit and got on base at all levels and will do the same in the big leagues.Let him play every day and give him a day off here and there against a lefty and he will hit 280-290 and get on base around 400 and hit 12 to 15 homers.I will take that and know he will get stronger as he matures.Stick him in left field and forget about him. And Jesse Winker gets in on the action. Shaping up into a nice afternoon at the old ballyard. Like the move to have Votto pinch hit there. Didn’t work out but was a good call by Riggleman. Unless Gameday is wrong, he got on base, also moving the other guy to 2nd, which is exactly what he is supposed to do. A home run would be nice, but I don’t understand the argument that it didn’t work. I just ment to say that they didn’t score in the inning, not that it was anyone’s fault. Somebody please find Joe Votto’s wallet. I think it was the wallet year of 2015 that he didn’t get hot until after Memorial Day. You got to wonder, though, this is Votto’s second off day in the last 2 weeks and the team had two off days on the 21st and 17th. Is there some nagging injury that Votto has that is requiring some extra time off this month? He did have some back discomfort a few weeks ago. And he was awful coy about that when it happened. There is something undisclosed going on here. It is something more than just a slow start and more than just the first phase of the age decline coming on. Have they said anything on the telecast about it, other than being a normal day off for Votto? .500 ball since the 3-18 start as noted in the original post. Series win against the ‘Rats. Good start from a young pitcher. All positives signs today at least to me. Onward we go … and somebody does need to help Joey find his wallet. Glad to see Winker finally hit one with some easy authority. Positive indeed.Castillo was very good today especially after giving up the two run homer in the 6th.Got the next two guys out and called it a day.Sign of maturity because young guys can get the jitters when it goes south sometimes. I agree because well we know about Billy and Duvall. Good day for all and Winker’s HR made the difference! Now they just need to make way for Disco in the rotation. Followed by 2 of the following….Garrett, Lorenzen, or Bob Steve. Homer & Romano needs to go. Mahle might just need to be skipped once or maybe sent down to AAA to work on his offspeed stuff. Garrett needs to stay in bullpen. Bob Steve had his chance. Lorenzen needs to go.